….Three books in one… a three-level structured approach : each one is an increasingly deeper-level presentation of the theory. THE MACRO-MODEL IS SUPPORTED BY LOGICAL INFRA-STRUCTURE : with many important adjacent aspects revolving around it. A STRUCTURED APPROACH : A multi-level approach of presentation with each book increasingly deeper levels. -2- THE ECONOMY FOR THE DUMMIES …. Demystify to the everyday person what the essence of the economy is in layman’s terms. 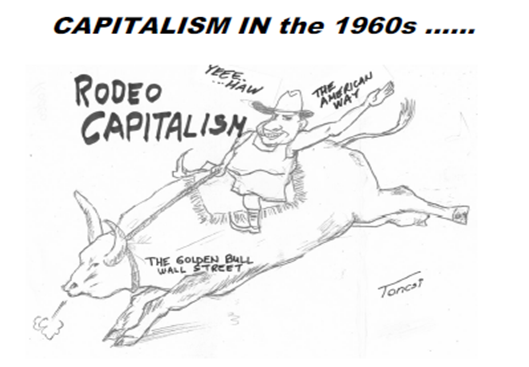 Introduction Section : What is CAPITAL-LESS-ISM ? It is pretty well the same as if we were stranded on a desert island for good and we would have got to figure out how to trade (quantitatively help) with each other to survive. What is FRACTIONAL RESERVE BANKING, (i.e. the old money creation or pseudo capital creation process)… How the solution to the present day crisis of lack-of-capital is the national re-appropriation of fractional reserve banking rights by the nation for sustaining all her economic needs. 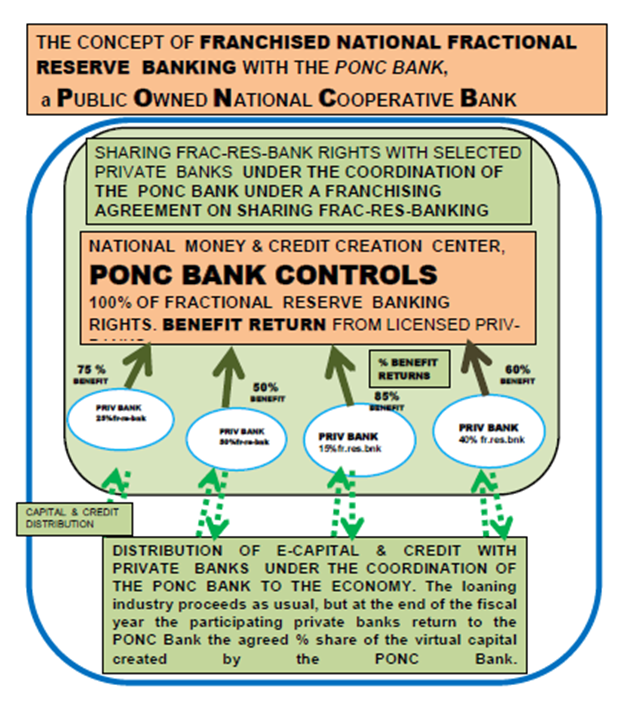 In practice, it would require a single national heart-brain, or the creation of a single national public owned banking center, which would franchise back to private banks this national currency creation process and coordinate its circulation within the private banking sector, as a public-private banking partnership for a more democratic capital access for economic development. -Section -1- the IMPENDING DISASTER FACTOR’S significance on speeding up economic changes and reforms. The good old days are long gone when parents’ worst fear was their children smoking grass or freaking out at Woodstuck. Now it has became joining Jihad and learning how to make bombs and kill, in order to hasten reforms. So, we discuss the IMPENDING DISASTER FACTOR’S significance on speeding up economic changes and reforms. We also discuss a general overview of the economic problems and then we explore some avenues for solutions. We discuss some tentative pre-conditions for durable PEACEFUL economic reforms: moral reforms and legal reforms prior to economic reforms. If these are not followed then economic reforms will be forced on by VIOLENT RADICALIZATION type reforms. We also study the “disaster factor” as an accelerating catalyst to speed up any economic reform process. 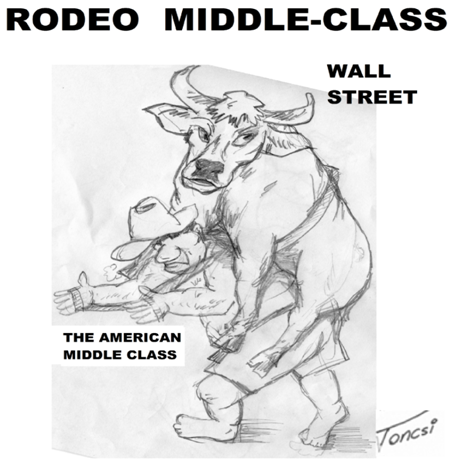 -Section 2- THE ECONOMY FOR THE DUMMIES (like myself )…. So, we try to demystify what the essence of economy really is …and how it makes our daily life tick …. in everyday layman`s terms. So, here we present a simplified but basic understanding of what the high-priest gurus of the economy have complicated for us as a new religion with ‘’mysterious free democratic market forces shaping our destiny ..(read unemployment), …our economic salvation (read pensions with ENRON like outfits)…, the benefits of our health care system with privatization and the necessity of corporate welfare for Wall-Street’’. 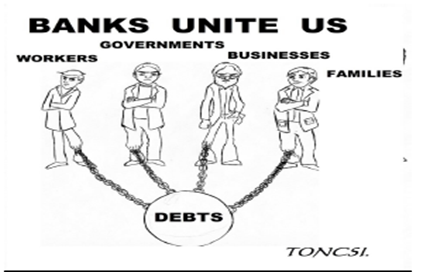 We avoid using ‘’Greek/Latin-terms’’ such as ‘’derivatives … quantitative easing… credit default swap …. Hedging…etc.“ We try to make sense as best we can and analyze what the economy is in a nutshell . What are its elements, its structure, its systemic analysis and its decomposition? What is the essence of money, why paper …why gold …and now why a-plastic-card ? What is the nature of capital, of credit, of demand, of the offer, of the market, of trade, of banks, and of the whole banking process? What is necessary to activate a community’s economy? What are austerity measures? What causes inequalities? What is globalization, national debt, personal debts, credit creation, and the concept of the economic crisis. We also look at the roots of the exponential explosion of national debt, which like a cancer devours national economies. -Section 3- We decompose and categorize economic problems. We distinguish between the SYMPTOMS and THE CAUSES. We also establish the chain-reaction-type cause- effects of basic problems causing other ‘’collateral’’ problems. A PHYSICIAN WOULD SIMPLY SAY THAT SEVERE ANEMIA CAUSES MAJOR HEALTH PROBLEMS. Similarly, we discuss in detail our fundamental overall perception of the problem in three ways: the lack of sufficient capital reserves for development, then the lack of adequate capital circulation for whatever capital remains to fuel economic activities, and finally the most disturbing fact that private banks retain the monopoly of ‘’creating artificial capital’’ i.e. (fractional reserve banking rights) This fact seems to falsify the democratic processes of society. We examine the reasons why there is a lack of capital in circulation, and also the reasons why capital need increases exponentially following the exponential increase of the world population while capital availability at best remains linear, even decreases, and is often fluctuating. As physicians first check your blood circulation by taking your PULSE and BLOOD PRESSURE during a routine exam, …similarly we propose a new method for studying the economy… as CAPITAL CIRCULATION, by studying it as an INFORMATION CIRCULATION SYSTEM. 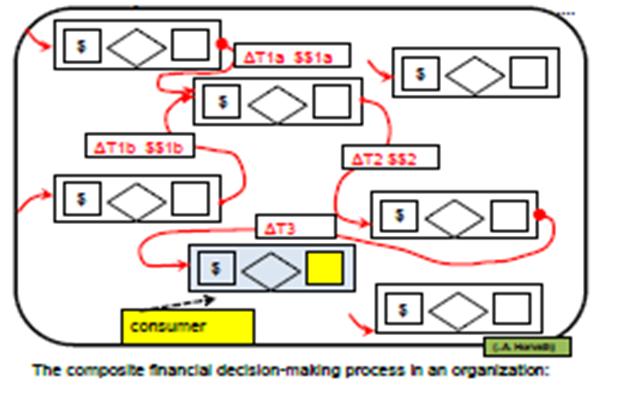 We depart from the usual STATIC ACCOUNTING BASED METHODOLOGY and visualize it as a DYNAMIC process: information flow or capital flow. We compare the ECONOMY TO AN ORGANIZATIONAL INFORMATION CIRCULATION SYSTEM UNDER CYBERNETIC (AUTO-REGULATING) PRINCIPLES. First we determine the crucial factors for the information-capital flow model that makes an information system a vital part of organizational efficiency. Second we compare these vital information flow characteristics to vital capital flow criterions. Then we compare a structured auto-regulating organization to a structured, auto-regulating, self-sufficient economy. What else is original about our approach is the fact that we added an innovative CRUCIAL TIME FACTOR PARAMETER for the efficiency-design of an information/capital circulation system. 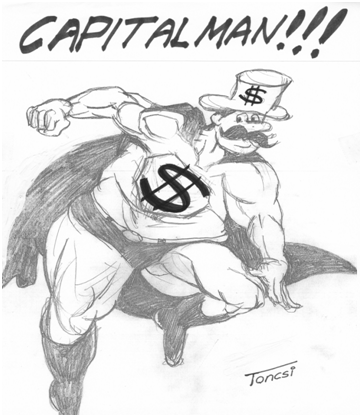 THE FINANCIAL PULSE AND CAPITAL FLOW ‘’URGENCY’’ PRESSURE notion. We arrive at some interesting design features for a theoretically efficient capital circulation model: THE HEART BEAT OF THE ECONOMY, which determines the critical capital flow requirements to people and institutions. This creates a sort of the foundation for a new science ECONO-DYNAMICS. It is described throughout sixteen chapters. 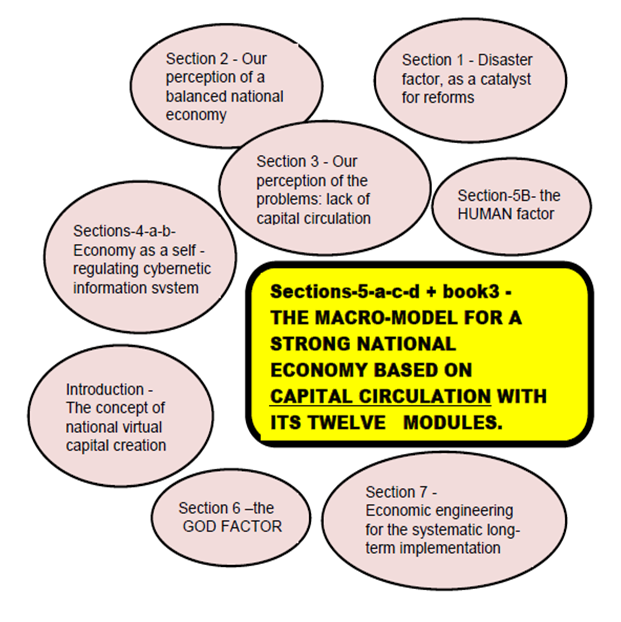 We propose a PRACTICAL BREAKDOWN OF THIS MACROMODEL into TWELVE INTERRELATED FUNCTIONAL COMPONENTS for improving the economy from a self-regulating cybernetic perspective. In order to determine these functions we got inspiration by looking at the macro-model of the human body’s BLOOD CREATION and BLOOD CIRCULATION system and its amazing efficiency. So we copy its potential for applying twelve similar, interrelated capital circulation solutions. We conduct a systematic analysis of it and examine its potential as a capital creation and capital circulation macro-model in a nation. Any ideas on how do we implement these ? i.e. How do we start from the lack of worldwide capital reserves, from the capital-starved economies to arrive at a fully operational capital-less banking system in order to supply the exponentially increasing capital needs of people and institutions? Simple, by CREATING VIRTUAL COMMODITY BASED E-CAPITAL. 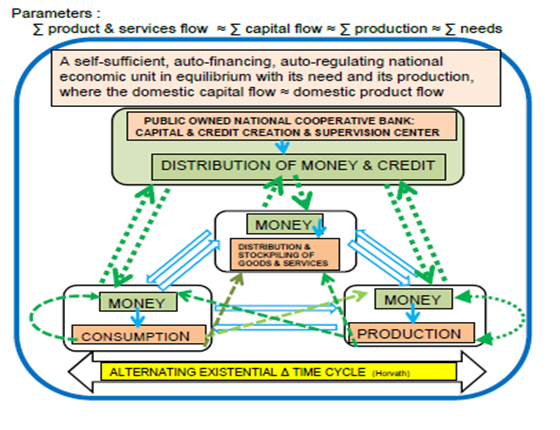 We propose a CLUSTER OF TWELVE INTERRELATED SOLUTIONS, forming a new science of ECONO-DYNAMICS to optimize a capital creation and capital circulation macro-model for a healthy national economy. These twelve principles can be integrated into 12 interrelated financial functions to form a dynamic structure as an ECONOMIC MACRO-MODEL. However, for these principles to be applicable we need to set it up as a science, ‘’ECONO-DYNAMICS’’ and it must be based on STABLE ECONO-DYNAMIC LAWS like in chemistry. The stability and predictability in chemical reactions happen because nature ALLWAYS respects the physical-electro-chemical properties of its elementary atoms. In order to achieve a similar socio-economic stability in society, we think that the key for stability is based on the respect of the basic human properties of the human structure. The “atom of the economy”: i.e. the human being has unchangeable basic need-properties. The smallest functional economic molecule is the family. 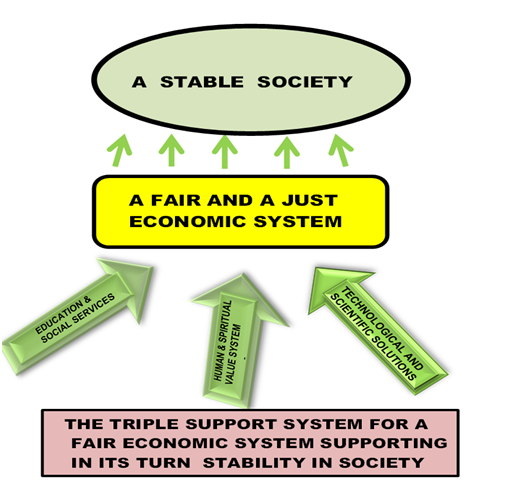 We isolated TEN BASIC LAWS for this, considering the basic nature of human beings TO BUILD A STABLE ECONOMIC SYSTEM ON. We also introduce the concept of ECONOMIC ENGINEERING as a precision requiring profession to assemble economic structures. The outcome is a blueprint of these basic laws combined with these twelve guiding principles. Hypothetically, it should provide comparatively more stability in achieving a stronger national economy. 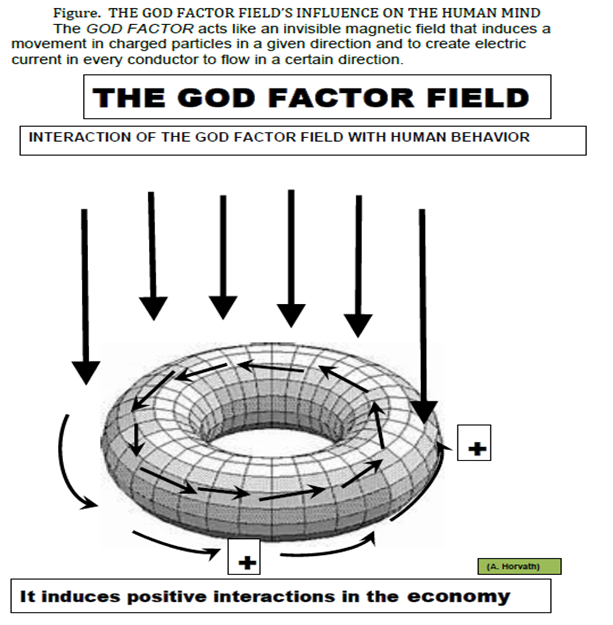 SECTION -6- we examine an elusive “GOD FACTOR’s” theory as having a profound effect on the psychology of billions of people. The strange navigational behavior of wild ducks indicated us the probable existence of a geo-magnetic pole and of a unique magnetic field perceptional ability in their brain, long before any scientific proofs. Could there be a similar ‘’god-factor’’ and god-factor-perception ability in billions of humans also, affecting their behavior and helping them to survive? This book section is not a misty, mushy, nostalgic old “prayer book type” approach, but indeed a very logical deductive rational discussion. We recognize that this is a most outrageous theory. In spite of advances in science, we observe that this ‘’god-factor’’ is exerting a mysterious force on our deep-rooted psychological existential anxiety, thus affecting billions of us deeply : acting on the human psyche, which governs all actions and all human interactions and which ultimately has many serious side effects on the economy also. We recognize however, that in the absence of a clear scientific proof one way or another, we can only rely on some mathematical insight (which can only predict an area of a different probability zone for a certain phenomens to exist or not) instead of scientific proof, (as was the case of Higg`s boson in nuclear physics and the existence of black holes in astro-physiscs). In the meanwhile, …as with wild ducks…. Or with similar cases, we might simply have to rely on ‘’scientifically unexplainable instinct’’ that nevertheless is indicating quantifiable observable facts and the increased probable existence of some unprovable conditions. Then, we follow up with a well-documented historical facts, that many economic systems have collapsed or have developed under a “mysterious god-factor`s influence in some nations. So we introduce a study, of what is the profound effect of this yet scientifically unproven ‘’god-factor’’ on individual and collective human behaviour ….. on human interactions and ultimately on collective socio-economic interactions? Maybe scientifically unproven yet in the field of economy, but perhaps mathematically predictable as a certain weird increased probability zone factor which also predicted the existence of the photons, the black holes and Higg’s boson. Our book is not a socio-political plat-form, but a theoretical MACRO-MODEL. Nevertheless, we have given some thoughts of the eventual gradual implementation of such a MACRO-MODEL in the long term. We assemble a systematic step-by-step rigourous approach to applying all these in the form of “ECONOMIC ENGINEERING.” These twelve principles of ECONO-DYNAMICS may be applied ONLY VERY PROGRESSIVELY to consolidate a truly democratic national economy in accordance with the ten basic economic laws. We propose a slow progressive road of a subsequent detailed chain of solutions to consolidate a national economy. 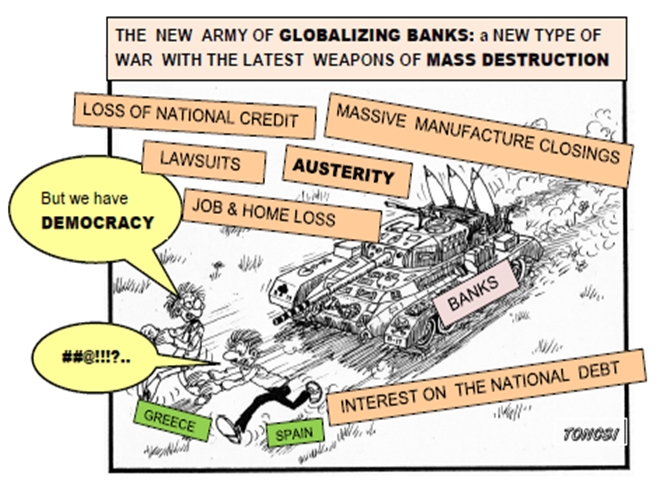 The aim is not bank bashing but the questioning of unilateral private financial control over national economies— we are against BANK BASHING, BUT we are proposing BANKING PROCESS REFORMATION. THE GOAL IS NOT THE NATIONALIZATION OF BANKS BUT TO CREATE A HARMONIOUS NATIONAL COOPERATION BETWEEN THE PRIVATE AND THE PUBLIC BANKING SECTORS. The goal is not a political platform but setting the FOUNDATION TOWARD A MORAL EVOLUTION SIMILAR TO ABOLISHING SLAVERY. So first step is a moral evolution followed, second by a legal evolution only then as the third step is possible an economic evolution on peaceful terms. Otherwise, we can only achieve violent reforms. We also take a look at the present radicalization tendency as the result from an unfair economy. We have a short integral factorial analysis of the inequality and the consequent tendency of radicalization in society. we conclude and introduce some topics where we will treat various related concepts on the international level, a sort of a CAPITALISM RODEO. We propose some new ideas for the International Monetary Fund and the World Bank to function under THE UNITED NATIONS’ RESTRUCTURED FINANCIAL ADMINISTRATION as international cooperative financial institutions, not private banks. Their funds would be derived from a complex international fractional reserve banking also, but as for their income capital, we also propose the institution of a UNITED-NATION INCOME TAX SYSTEM FOR MULTINATIONALS and OFFSHORE financial institutions. THIS WOULD PERMIT THIS RESPECTED WORLD GOVERNING BODY TO HAVE FINANCIAL REVENUES to exert its functions instead of begging member nations to pay up membership fees. Oh yes, and what if the values of the votes of the member nations would be factored in with their population? Wouldn’t it be much more democratic? India and China would outweigh us, but ultimately the determinant in the decision making is the global human need, factored in with the global number of human beings. These 8 sections are discussed at four levels of depth, at each level we are going in with increasingly more technical and theoretical details. So this 4 level depth infrastructure is really three books in one. Level #0, is only a very preliminary overall description for general easy understanding of our concepts. Level #1 these same eight sections are presented as more detailed executive summary in order to give the reader an in-depth view. Level #2 we will go into elaborate theoretical and mathematical considerations mainly for for academic or professionals readers. 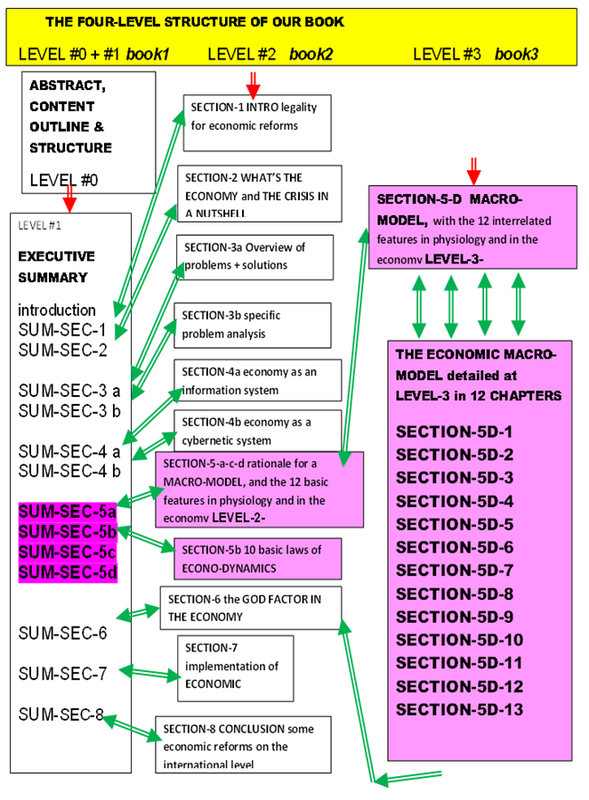 Level #3 we go further describing the actual macro-model even deeper .